Endodontic Retreatment: With proper care, most teeth that have undergone endodontic treatment-a root canal-can last as long as other natural teeth. 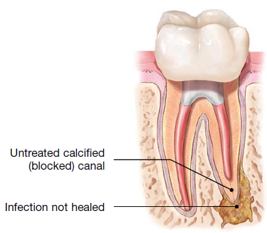 In some cases, however, an endodontically treated tooth fails to heal. Occasionally, the tooth becomes painful or diseased months or even years after successful treatment. If your tooth has failed to heal or has developed new problems, you have a second chance. An additional endodontic procedure may be able to create a more favorable environment for healing, allowing you to save your tooth. Why do I need an additional endodontic procedure? 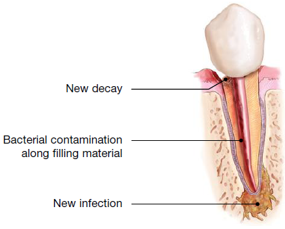 Human saliva is full of bacteria that can cause disease if they find their way into the root canal system. 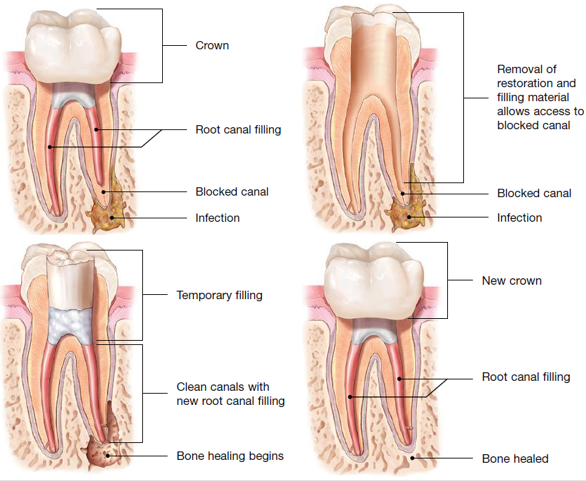 • A loose, cracked, or broken crown or filling can expose the tooth to new infection. After removing the canal filling, the endodontist will clean the canals and carefully examine the inside of your tooth using magnification and illumination, searching for any additional canals, hidden fractures or unusual anatomy that requires treatment. After your endodontist completes retreatment, you will need to return to your dentist as soon as possible to have a new crown or other restoration placed on the tooth to protect it and restore it to full function. Nothing looks, feels or functions like your natural teeth. Whenever possible, it is best to save your natural tooth. Retreated teeth can function well for years, even for a lifetime. Advancements are constantly changing the way root canal treatment is performed, so your endodontist may use modern technologies and techniques that were not available when you had your first procedure. Your endodontist may be able to resolve your problem with retreatment. Ultimately, your treatment decision should be based on a plan that you and your dental team have determined to be best for your overall health. The cost varies depending on the complexity of the procedure. It probably will be more involved than your first root canal treatment, because your restoration and filling material may need to be removed to accomplish the new procedure. In addition, your endodontist may need to spend extra time searching for unusual canal anatomy. Therefore, you can generally expect retreatment to cost more than the initial endodontic treatment.